Since 2002 the New Media Consortium’s Horizon Project has issued an annual report describing and predicting the impact of emerging technologies in the coming five years. Libraries of all kinds, but particularly academic libraries use this report as a guide to planning for investments in new technology, training and initiatives that will help them to better serve their users. Not surprisingly, the 2011 Horizon Report states that eBooks and mobile devices are moving closer to mainstream adoption for educational institutions in the near term. In the report’s “second adoption horizon” (two to three years) augmented reality and game-based learning are seen as the two technologies most likely to influence post-secondary education. Augmented reality layers information on top of a view of the normal world (typically on a mobile device). For example students walking by a building on campus can sync their device to a positional signal and it will display information about the building (e.g. a directory of offices inside, when it was built, the architect, etc.). Game based learning for individual students or small groups can be integrated into coursework. Great potential lies in the ability to stimulate technology-supported collaboration, problem-solving and procedural thinking. Looking still farther ahead, the report suggests that in four to five years, gesture-based computing and learning analytics will become more commonplace on campuses. Gesture based computing is essentially “wearable technology” that responds to body motion instead of a keyboard or mouse for computer input. Learning analytics uses data gathering tools to enable study of student engagement, performance and practice, with the goal of using this data to revise curricula, teaching and assessment in real time. In other words, this is technology designed to stimulate and support very dynamic learning environments. Academic libraries will no doubt be watching these trends and collaborating with faculty and instructors to review and evaluate the predictions described in the report, and then plan services around their findings. The Anythink libraries are literally breaking new ground in their efforts at building community and developing partnerships. 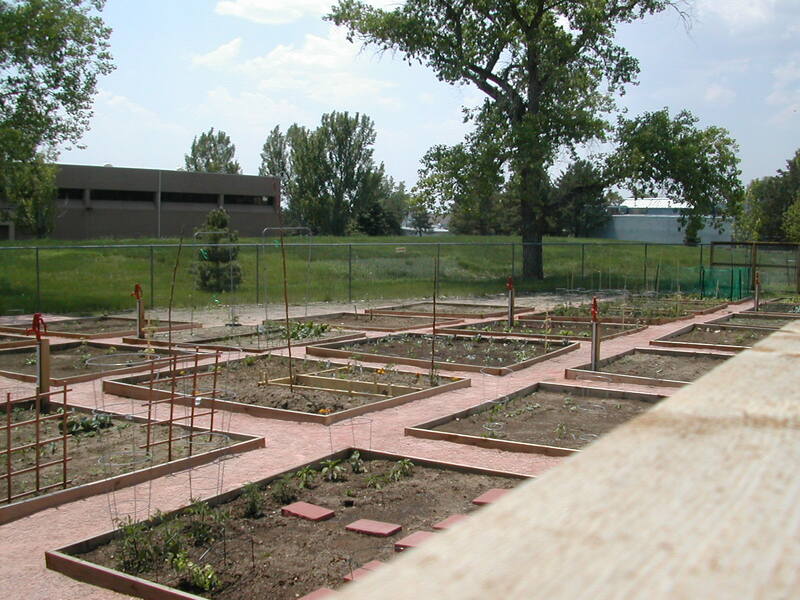 At two locations, Commerce City and Perl Mack, community gardens are taking shape on plots just outside the libraries. They were planned in partnership with Denver Urban Gardens. Anythink’s goal is to focus 50% on food production and 50% on community building. As focal points for the neighborhoods, there will be workdays that bring gardeners and passers-by together as well as discussion about sustainable gardening and what grows well and what doesn’t. “Read, think, eat” is one heading in a recent library newsletter describing the project. What better place but at the library? The summer reading program at Anythink libraries has stepped away from the often-used model of providing participants with prizes and coupons from local merchants and fast food vendors. Gone also are the tally sheets that track reading volume over the summer. Their “My Summer” program is focused on learning and creativity based on the thinking that reading stimulates. So it’s more about quality than quantity. Of course the challenge for parents with kids in this or any program is to help develop realistic goals for the products of young, creative thinking and to support children in reaching those goals. I think this model has greater potential than the more often-used ones, for enriching a child’s life experience based on the reading they do over the summer. I look forward to watching how the Anythink libraries evolve and change over time. They have challenged and disrupted (in a respectful way) many long-held public library conventions. Their success may help lay the foundation for the survival of public libraries in the face of threats from diminishing relevance in the crowded “attention marketplace” of our current era. Anythink is the brand name for seven cutting edge, revolutionary libraries in Adams County, Colorado. 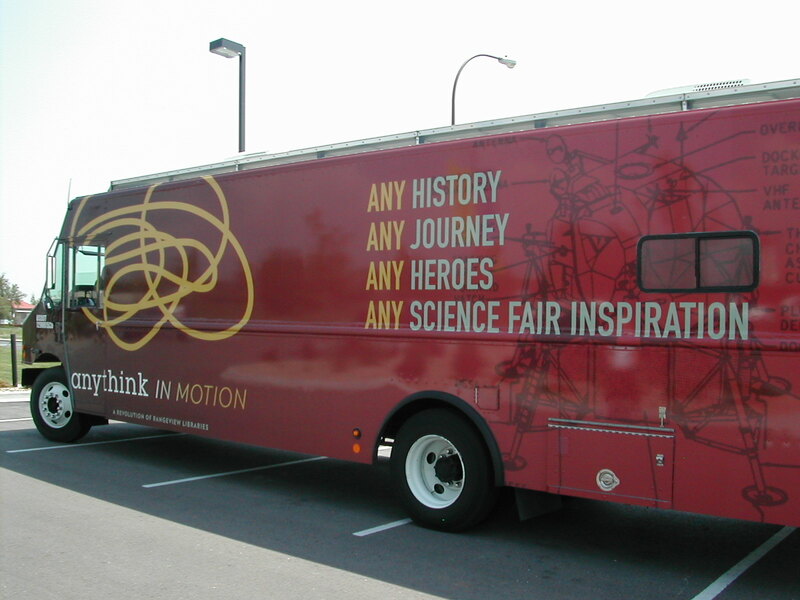 To be more specific, as their signage clearly says, the seven Anythink locations and the bookmobile (aka “Anythink in motion”) are the neighbourhood service points for the Rangeview Library District. Libraries don’t often embrace branding in the way Anythink has done. In fact some reject the concept entirely. But as an outcome of branding and what Anythink managers themselves call a disruptive approach to the provision of library services, the results have been phenomenally positive. In 2003 the Denver Post labelled the Adams County Public Library, as Anythink was then known, the “worst in [the] state”. Fast forward to 2010 when compared to 2009, checkouts increased by 50%, the number of library card holders went up by 30% and visits to the website rose by 84%. 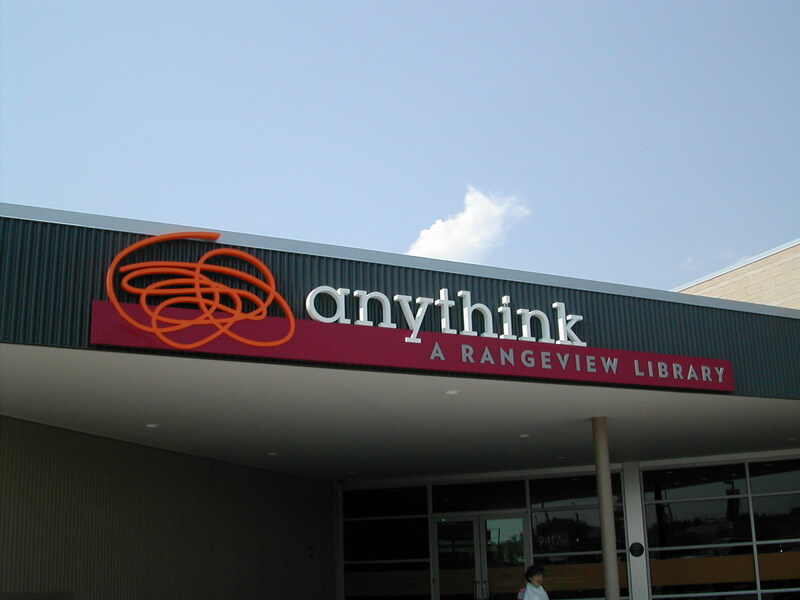 Public approval is rising and there’s a buzz in the library community about Anythink. Anythink’s director, Pam Sandlian Smith and staff at four locations hosted me and my colleague Mary Somerville in a daylong tour. Also, they very generously arranged for Anythink in motion to take time from its busy schedule for a rendezvous and photos. Pam, the staff and her Board have successfully rallied behind the brand and some positive disruptions to the usual conventions in public libraries. Gone is the Dewey system which has been replaced by “WordThink”, a method adapted from bookstores for arranging books and DVDs, etc. on shelves. Fines are not charged for overdue items, food and beverages are allowed, librarians are known as Guides and branch managers double as Experience Experts. These are more than just cosmetic changes, and reflect a hip, innovative and creative organizational culture. In addition to these positive disruptions, new and renovated buildings are open, inviting and beautifully designed. Clearly, Anythink libraries have layout and design features that provide flexibility, a welcoming, comfortable environment and intuitive access to books, magazines, computers and to staff. Those staff members readily detach themselves from desks to roam the floor, to chat with and engage customers without being intrusive. In my next post about Anythink I will highlight other of its initiatives that help build community in the area, and go beyond just thinking to creativity and learning. Before visiting the anythink libraries in nearby Adams County, I took in the Green Valley Ranch branch of the Denver Public Library (DPL). Cori Jackamore, the co-manager of Children’s and Family Services gave me and my colleague, Mary Somerville, an enthusiastic and informative tour of this new and innovative library. DPL has implemented a model that offers service options that vary by branch or neighborhood. Some branches specialize by offering programs, books and materials focused on certain age groups or interests. So customers need to learn which locations are best for their age and interests. This is a flexible model that can be tweaked to meet changing needs. For example the Green Valley Ranch library caters primarily to children who visit with their parents, and to teens that attend a nearby middle school. Opened in March 2011, the branch is designed for maximum flexibility. Many bookshelves are actually on wheels, as are the sleek looking tables, which can be moved apart and back together in different configurations. Public art that is “participatory” in that it interprets concepts from the searches that customers type in a nearby computer (without being so direct as to reveal what they’ve typed), and images are then displayed in on multiple screens as part of the art installation. Customer service points that enable good sight lines, and staff who rove to check in with customers as needed. Lots of cool “hands on” kinetic boards attached to end panels of shelves. These are great for occupying young kids while mom or dad picks out a favourite book, DVD or magazine. The branch was designed around the themes of “plains” and “planes” because the Denver airport is close. This is big sky country after all. So the colours reflect the native plants of the plains, the public art piece is called “Cloud Seeding” and there is a real cockpit of a 737, once used by Boeing for training purposes. During my tour it was full of boys testing out their emerging pilot skills. More kinesthetic activity to support learning! I’m in Denver, Colorado for five days where I will be seeing the Denver Public Library and will be spending all day Monday visiting the newly branded and revolutionary “anythink libraries” in nearby Adams County. Stay tuned for more info and photos in upcoming posts.